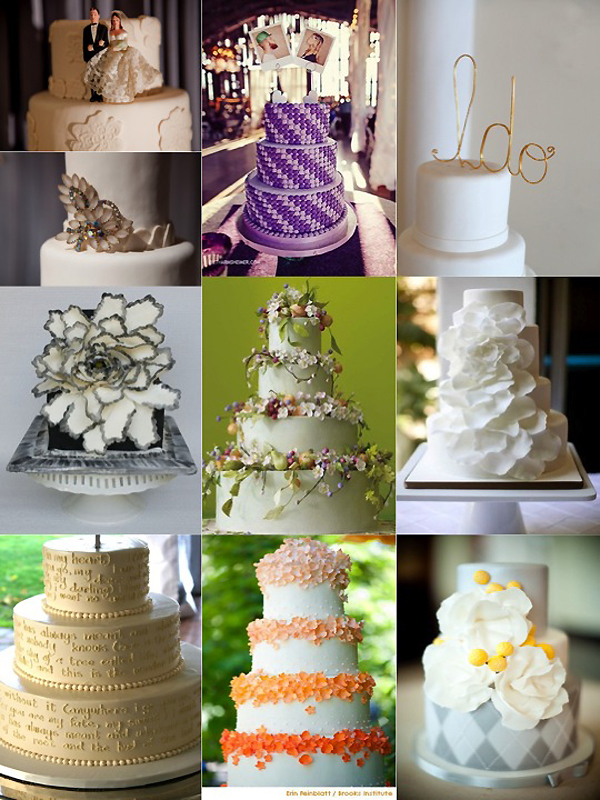 Who doesn’t love wedding cake? As a wedding planner in Chicago, I must admit – choosing a wedding cake is one of the tastier parts of the wedding planning process. Over the decades, cakes have made a shift from a simple tiered white cake to having extravagant designs and architectural abilities. Sometimes, the wedding ‘cake’ isn’t even a cake at all—We were all on board with that cup cake fad! So you want to keep up the tradition of the cake but want to modernize the style? Here a few favorites from the LOLA Pros! Keeping a basic cake and a traditional topper is by no means a thing of the past. A monogram, the classic bride and groom set up, or a vintage keepsake or brooch used as a cake topper—the sky’s the limit. Some of our favorites are the metal “I do” and the Polaroid pictures! Cascading flowers across the cake are always a safe go-to that really adds a lot of beauty to a cake. The floral trend has not gone away, but has taken a turn to the more creative side of things. One large sculpted sugar flower as a main focus is a great modern take on floral on cake. It can be a variety of shapes, colors, and sizes to tie into the theme of your wedding. You can also choose to keep it classic by surrounding the tiers with real flowers and greens. Chevron, argyle, and ombre’ are all popular patterns that can add a ton of personality. Different width tiers with a pop of color and texture add an amazing focus and pull attention away from the top of the cake, which is a sweet surprise and newer trend. One of our favorites is having the vows written on the cake as the center of décor! Be sure to check out our Pinterest Board- Cake Topper Round-Up– for more examples and even more ideas!